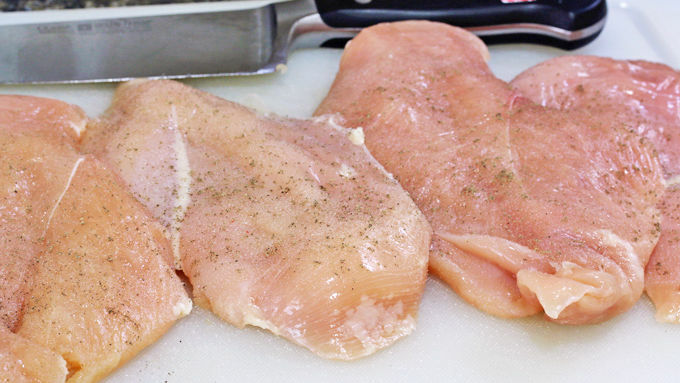 Cut the chicken breasts lengthwise to make 2 thinner filets from each breast. (If you prefer thicker chicken breasts you can leave them whole and proceed as the recipe instructs.) Sprinkle each side with some salt and pepper. Heat the butter in a skillet over medium-high heat; add the chicken breasts and fry on both sides until browned. Transfer chicken and pan juices to slow cooker and add minced garlic, white wine, lemon juice, salt and chicken broth. Cook on low for 5-6 hours. 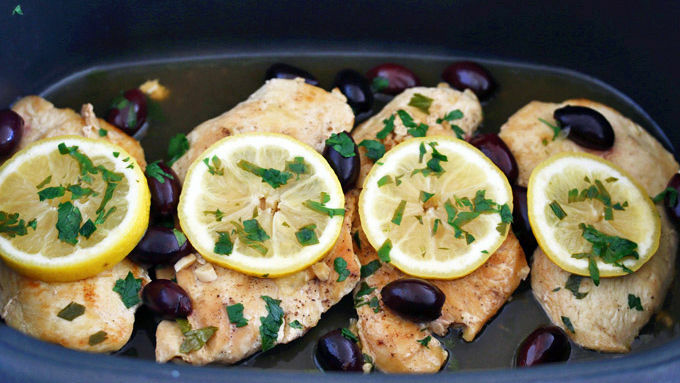 In the last hour add the olives and lay lemon slices and parsley on top of each chicken breast. Cook for 1 hour more. Mix 2 tablespoons cornstarch with 2 tablespoons water to form a slurry. Add this mixture to the liquid in the slow cooker and let it heat through until the sauce is thickened. Add salt and pepper to taste. Serve with steamed rice or mashed potatoes and veggie of choice. 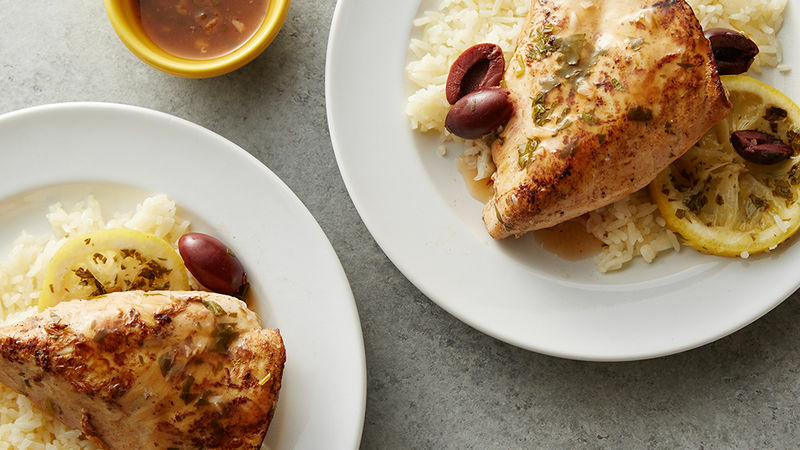 Lemon, white wine, and Kalamata olives bring tons of bright flavors to this easy chicken dinner. Lemon seems to go with practically anything, be it sweet or savory. It adds a depth and brightness of flavor that magically enhances every dish to which its added. Chicken and lemon have always been a great combination—here's an easy slow-cooker recipe that reunites them. 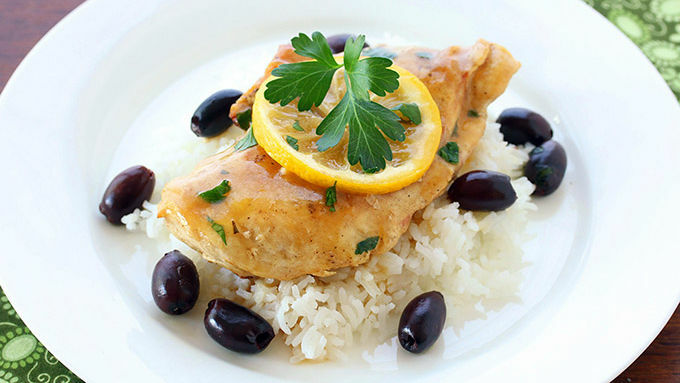 You’ll love the fresh mellowness the lemon adds to this chicken, coupled with the flavor of the Kalamata olives. And of course the white wine binds everything together beautifully. Serve this up and no one will ever guess it how simple it was to make! 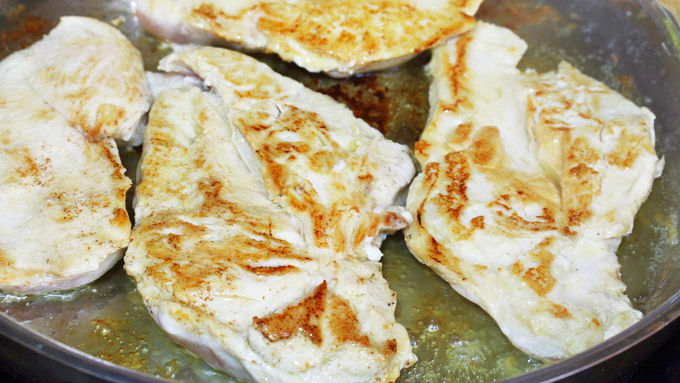 Cut the chicken breasts lengthwise to make two thinner filets from each breast. If you prefer thicker chicken breasts you can leave them whole and proceed as the recipe instructs. Sprinkle each side with some salt and pepper. Heat the butter in a skillet over medium-high heat and add the chicken breasts. Fry the chicken on both sides until browned. Transfer the chicken and pan juices to the slow cooker and add the garlic, white wine, lemon juice, salt and chicken broth. Cook on Low for 5-6 hours. In the last hour add the olives and lay the lemon slices on top of each chicken breast with the parsley. Cook for another hour. Stir the cornstarch mixture into the liquid in the slow cooker and let it heat through until the sauce is thickened. Serve with steamed rice or mashed potatoes and a vegetable of choice. Enjoy! For more easy and delicious slow cooker recipes, visit Kimberly’s food blog The Daring Gourmet.